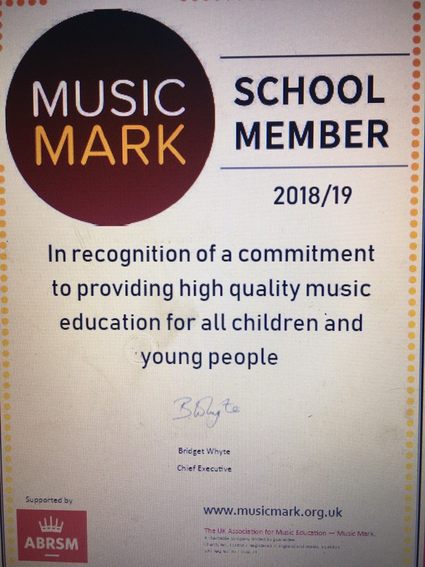 Congratulations on becoming a 2018/19 Music Mark School Member! You have been nominated, and supported financially by your local Music Service/Hub. They have recognised the value that you place on music and requested that you become a Music Mark School Member. We would like to thank you for all the hard work you and your colleagues do to ensure that pupils at your school are able to access and engage with a high-quality music education. Your dedication to offering and delivering a broad and balanced curriculum is both welcomed and celebrated. I am therefore delighted to enclose your membership certificate, which I hope you will feel able to share with your whole school community.